THE FRIENDS FOR UNIFIED POLICE K9 IS A NON-PROFIT TAX-EXEMPT PUBLIC CHARITY TO HELP PROMOTE AND SPONSOR THE UPD K9 UNIT. The organization was founded to assist in the purchase of service animals to be used for public safety throughout Salt Lake County. Fiscal constraints typically make it difficult to purchase service animals in an expeditious manner. The high demand for service animals by the military makes it extremely hard to find quality canine for law enforcement. “Friends” allows an avenue for immediate selection and reimbursement for quality canine. We are dedicated to supporting our canine partners. THE ORGANIZATION RELIES ON DONATIONS TO ACCOMPLISH OUR GOALS. Sgt. 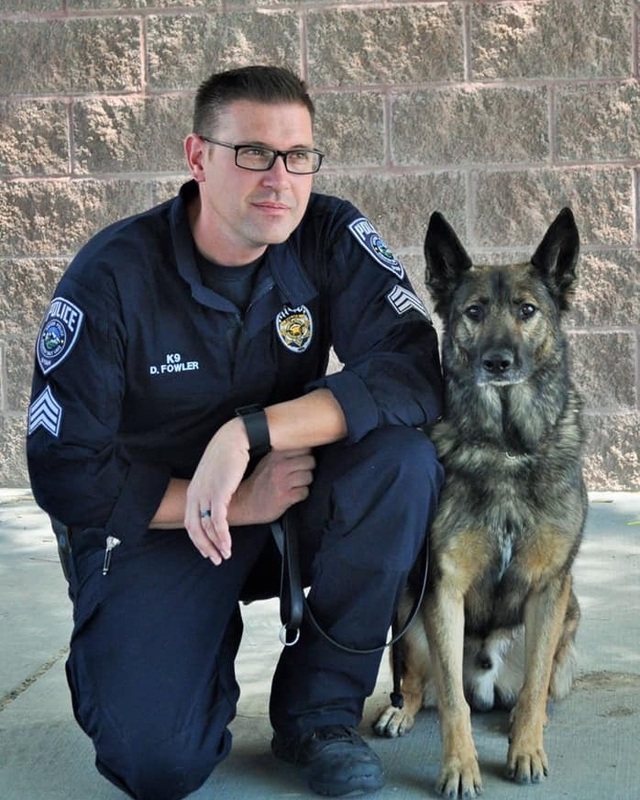 Fowler and his partner “Animal” were chosen as the Unified Police K9 Team of the year. Sgt. Fowler and Animal have been an incredible asset to public safety throughout Salt Lake County. Sgt. Fowler’s leadership has inspired each UPD K9 handler and created a cohesive unit. Sgt. Fowler and his partner have also competed in local and national K9 trials with great success. Sgt. Fowler recently accepted a new assignment as Supervisor of the Metro Gang Unit. Animal was retired and will enjoy his time with the Fowler family. K9 "Aldo" laid down his life last night to protect his handler during the search and apprehension of a fugitive. The UPD K9 Unit is mourning the loss of a great K9. The organization relies on donations to accomplish our goals. Click here for more information. Click here to view links to our favorite partners. Larking Mortuary and Rocky Mountain Monument donated a beautiful monument honoring cougar and loyalty of working K9 in front of the Special Operations Precinct. Unified Police K9 Unit is proud and excited about their newest K9 addition! Sheepdog Championships provide a great K9 Demo Crowd! The Unified Police Department of Greater Salt Lake joined several partner police departments to demonstrate to the public the level of service provided by our police service dog teams. The Unified Police K9 Teams recently competed in the UPOA K9 Trials. Sgt. Reyes showed great courage as he paid his respects to his partner and protector "Dingo" at the memorial service held on July 15th. Hundreds attended the memorial service held at Herriman High School. Dingo was given full honors for his sacrifice. As handlers, we constantly strive to improve our K9 partner’s training experiences by implementing different scenarios and venues. Experience has shown that our partners become wise and learn to “pattern train” if we use the same venues. In order to achieve productive training we are constantly looking for new venues. Commercial and residential structures are ideal for scenario training. Typically vacant properties as well as properties that are under construction are used. Unfortunately these properties are often subject to vandalism and theft. Our experience has been that with the current price of scrap medals such as aluminum and copper, more damage is caused by the theft then the gain the criminals achieve by stealing the items. The benefit of having multiple K9 teams training at random hours and days is a definite deterrent. We seek every venue imaginable. Businesses, Home Owners associations, neighborhood watch groups, etc… If you are interested in participating in the program just fill out the online form on the right or email contact@updk9.org. A member of the unit will contact you for further information as well as answer any questions you may have.